Summary: Explains how to assign Office 365 ProPlus licenses to users, and how individual installations are activated. To deploy Office 365 ProPlus to users in your organization, you start by assigning licenses to your users. Then, each user can install Office 365 ProPlus on up to five computers. Each installation is activated and kept activated automatically by cloud-based services associated with Office 365. This means you don't have to keep track of product keys. It also means you don't have to figure out how to use other activation methods such as Key Management Service (KMS) or Multiple Activation Key (MAK). 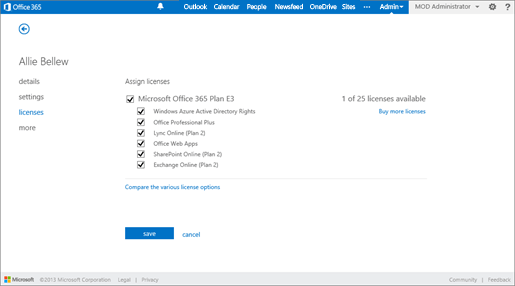 All you have to do is make sure you purchase enough licenses, keep your Office 365 subscription current, and make sure your users can connect to Office Licensing Service via the Internet at least once every 30 days. The information in this article also applies to Project Online Desktop Client and Visio Online Plan 2 (previously named Visio Pro for Office 365), which are licensed separately from Office 365 ProPlus. The number of available licenses available for Office 365 ProPlus depends on your organization's Office 365 subscription level. To assign a license to a user, you select a check box on the licenses page for the user's account. After that's done, the user can install Office directly from the Office 365 portal or you can deploy Office to your users from your local network. If the user hasn't been assigned a license, the user can't install Office from the Office 365 portal. You can remove a user's license (for example, if the user leaves your organization). After you do this, any installations of Office 365 ProPlus that the user had go into reduced functionality mode. The Office Licensing Service, a part of Office 365, keeps track of which users are licensed and how many computers they've installed Office on. As part of the installation process, Office 365 ProPlus communicates with the Office Licensing Service and the Activation and Validation Service to obtain and activate a product key. Each day, or each time the user logs on to their computer, the computer connects to the Activation and Validation Service to verify the license status and extend the product key. As long as the computer can connect to the Internet at least once every 30 days, Office remains fully functional. If the computer goes offline for more than 30 days, Office enters reduced functionality mode until the next time a connection can be made. To get Office fully functional again, usually a user can simply connect to the Internet and let the Activation and Validation Service reactivate the installation. 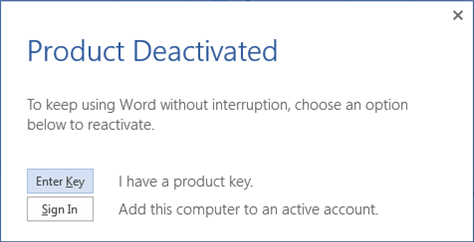 Because of its online activation features, Office 365 ProPlus won't work on computers that are completely cut off from the Internet. 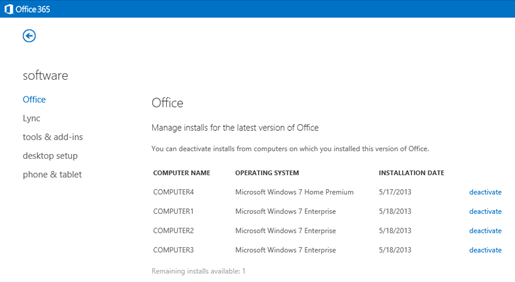 For those computers, we recommend installing Office Professional Plus 2019 and using a traditional activation method such as Key Management Service (KMS) or Active Directory Domain Services. What is reduced functionality mode? If the user hasn't been assigned a license, and they try to use Office 365 ProPlus on a computer where it's installed, Office will be in reduced functionality mode. Also, the user will be prompted to sign in and activate every time they open an Office app, such as Word or Excel.